Consumer websites screened across the EU show that many consumers face unclear information on prices and discounts when buying online. 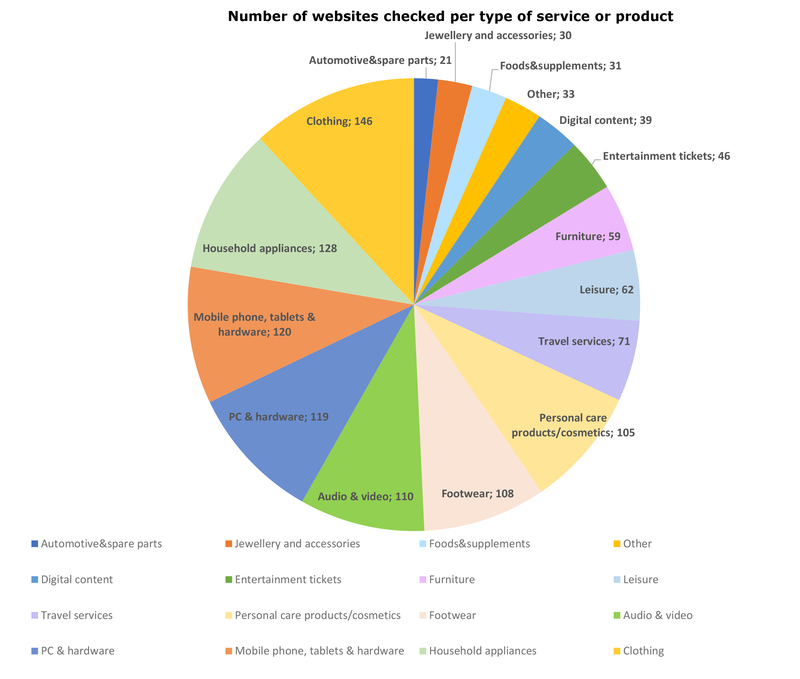 The European Commission and national consumer protection authorities recently published the results of an EU-wide screening of 560 e-commerce sites offering a variety of goods, services and digital content, such as clothing or footwear, computer software or entertainment tickets. 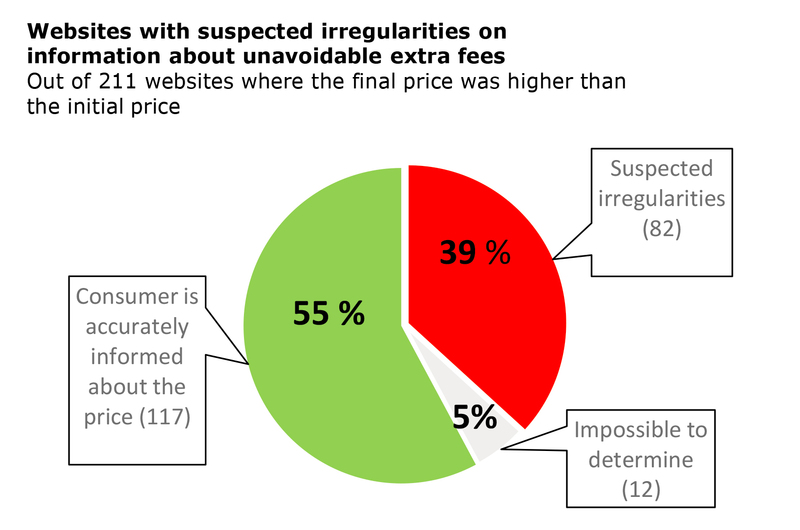 Around 60% of these websites showed irregularities regarding the respect of EU consumer rules, predominately in relation to how prices and special offers are presented. “Online shopping provides many opportunities for consumers. However, more than half of the websites show irregularities, in particular on how prices and discounts are advertised. This must stop as the consumers are often led to confusion and higher price than intended. I am appalled by the high number of the websites that have these problems – I hope they are unintended. Online traders need to fully respect EU consumer rules. National consumer authorities, with the assistance of the Commission, will now take the necessary steps to stop such unfair business practices”. 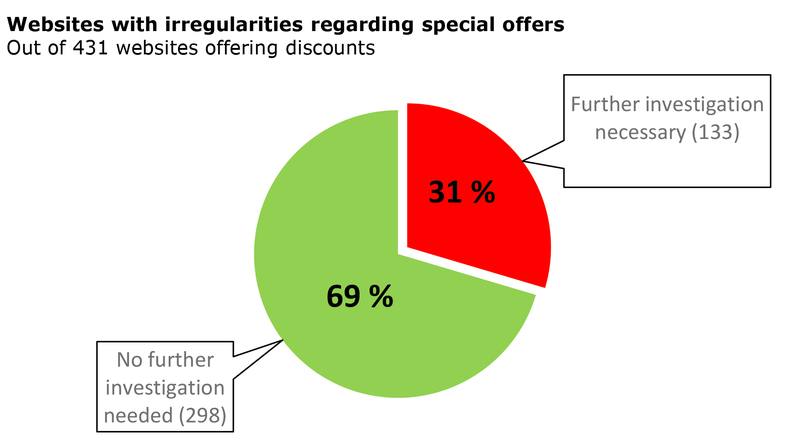 For more than 31% of the websites offering discounts, consumer authorities suspected that the special offers are not authentic or they found the way the discounted price was calculated unclear. On 211 websites the final price at payment was higher than the initial price offered. 39% of those traders did not include proper information on extra unavoidable fees on delivery, payment methods, booking fees and other similar surcharges. EU consumer law obliges traders to present prices inclusive of all mandatory costs, and where such costs cannot be calculated in advance, their existence at least needs to be clearly presented to the consumer. 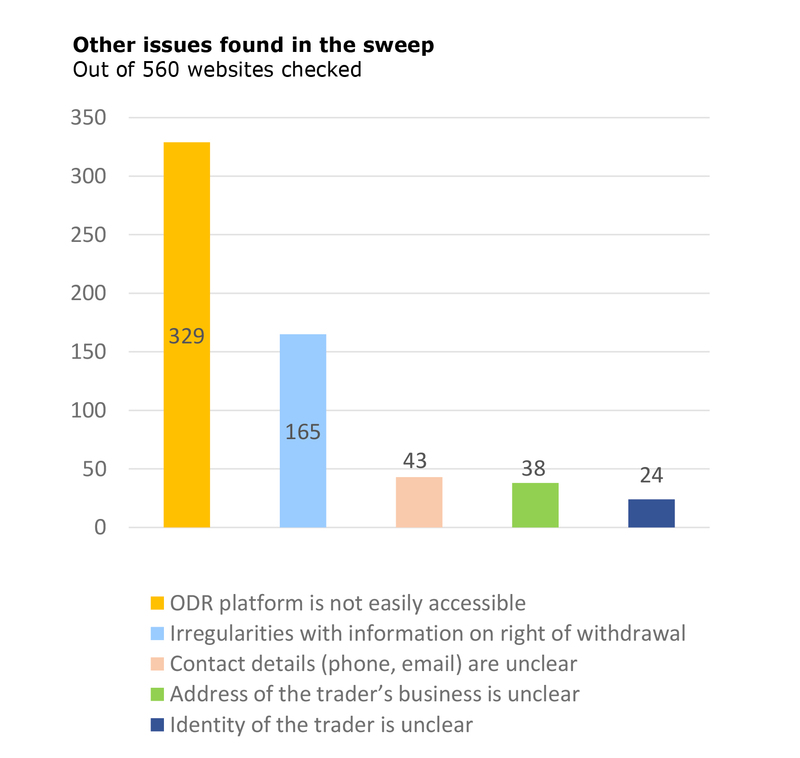 In 59% of the 560 websites checked, traders failed the obligation to provide an easily accessible link to the Online Dispute Resolution (ODR) platform, which is obligatory under EU law. The ODR Platform allows consumers and traders to resolve disputes without going to court. In almost 30% of the websites, irregularities were found in relation to how information was presented about consumers' right to withdrawal. According to EU law, consumers must be clearly informed about their right to withdrawal when they buy online. Consumer protection (CPC) authorities will ensure full compliance of the traders concerned by activating their national enforcement procedures where necessary. Thanks to EU law, every consumer in the EU has the right to receive clear, correct and comprehensible key information from a trader about the good or service before making an online purchase. This information must include aspects such as the characteristics of the product, the price inclusive of taxes, delivery costs and the existence of a right of withdrawal or cancellation. Every year the Commission coordinates the screening of websites, with the help of the Consumer Protection Cooperation (CPC) network. This network brings together the national consumer authorities of 30 countries (28 EU countries, Norway and Iceland), which are responsible for enforcing EU consumer protection laws in the EU. This screening was carried out last November by consumer protection authorities in 24 EU Member States as well as Norway and Iceland. An EU-wide screening of websites ("Sweep") is a set of checks that are carried out simultaneously by consumer protection authorities in different countries. 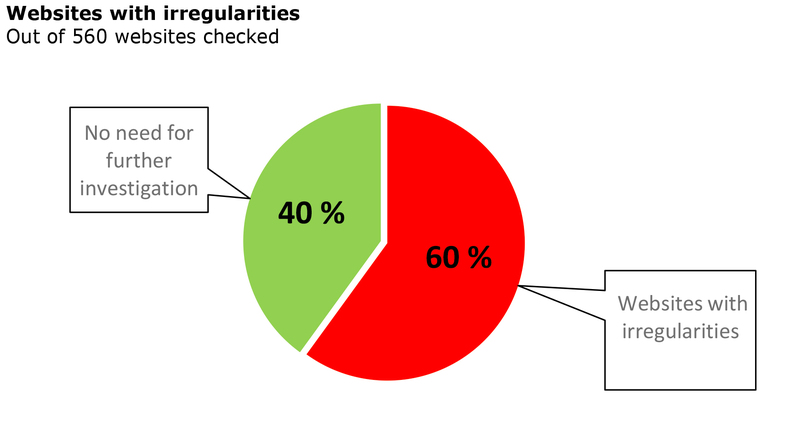 These checks show whether traders respect EU consumer protection laws. Where the checks reveal potential breaches of EU consumer law, the consumer protection authorities contact the responsible companies and ask them to make corrections. Previous "Sweeps" have focused on: airlines (2007), mobile content (2008), electronic goods (2009), online tickets (2010), consumer credit (2011), digital contents (2012), travel services (2013), guarantees on electronic goods (2014), consumer rights directive (2015), comparison tools in the travel sector (2016) and telecommunication- and other digital services (2017).